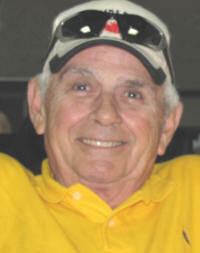 Joseph H. “Captain Joe” Freeman, 75, of St. Jacob, died Saturday, October 24, 2009 at Barnes-Jewish Hospital in St. Louis. He was born March 25, 1934 in St. Louis, MO to Joseph H. and Mary (Kelleher) Freeman, Jr.; they preceded him in death. Also preceded in death by a son-in-law, Scott Billhartz. He married Wendy (McIlvena) Wisdom on February 20, 1985 in St. Louis, MO; she survives in St. Jacob. sisters-in-law, Cathy (Joe) Bienkowski of Florissant, MO and Susan (Steven) Kramer of Wentzville, MO; and nieces and nephews and many friends. Joseph was a purchasing agent and driver for Bates Utility in Weldon Springs and was a parts manager for Holekamp Equipment in Westport. He also served in the U.S. Army during the Korean Conflict. Visitation will be on Thursday October 29 from 4 to 9 PM at the Moss Funeral Home in Trenton, IL.